Hello all! I'm already falling behind with the posts. This entry marks the close of our 6th full day here in Switzerland. One more day here tomorrow (to hit the ski slopes - wish us light falls and strong bones), then it's off to our first city in France: Lyon! This is an amazing traditional Swiss lunch Kate and I shared in the tiny town of Gruyere, Switzerland. It's called Rösti. Very simple, and also very delicious. The large crock of grated potatoes was about the size of my head. Maybe a little larger. It seemed huge at the time. The potatoes had been mixed with some onions, and possibly a little butter or animal fat before being crisped in an oven. You could have the dish just like this (au natural) or opt for the addition of smoky ham and a fried egg. Obviously we went for the latter option. 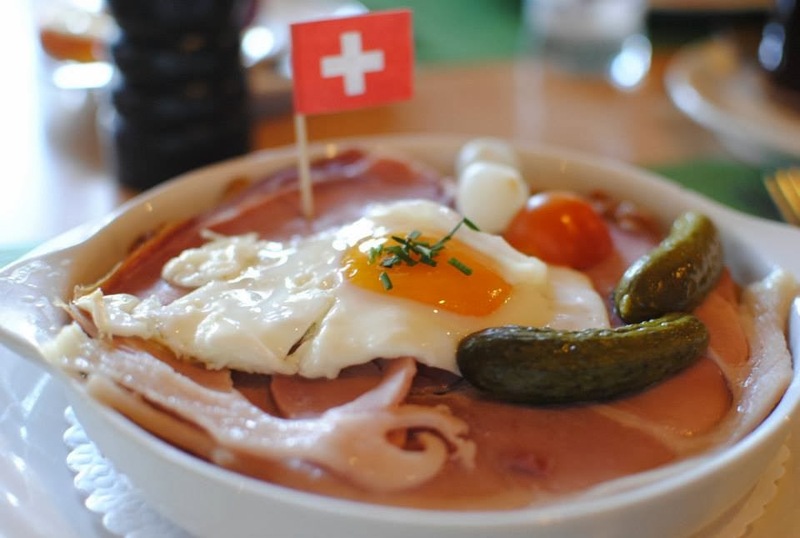 Our Rösti was accompanied by a couple cornichons, pickled onions, and a tiny Swiss flag - how patriotic. The crispy potatoes were perfectly seasoned, and fun to eat - buried beneath the pile of ham and egg. I joked (partly very serious), that I'd like to have one of these for breakfast every morning. Although I probably wouldn't be around very long, I would be a very happy person.